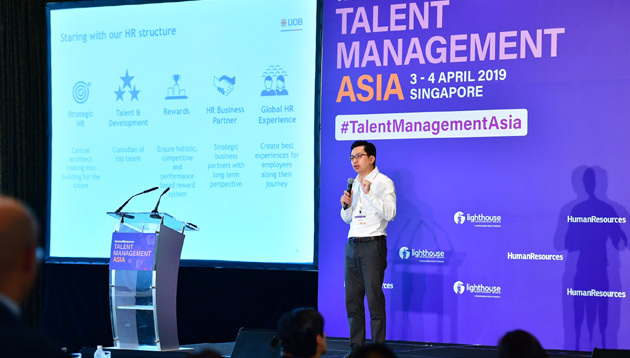 While hosting segments at Talent Management Asia 2019, Singapore, here’s what Aditi Sharma Kalra and Jerene Ang call out as their key takeaways. Having hosted Talent Management Asia 2019, the region’s leading human capital strategy conference, for seven years; this year, the Human Resources project team, led by Priya Veeriah, continued to inject new ideas and innovative formats into a compelling conference agenda. To facilitate context-relevant learning, and high interaction, delegates had access to three parallel streams: Strategic HR, Design-Thinking HR, and The Future of Agile HR, led by chairpersons Dazzling Chong, Futurist, Chief Talent Officer, Great at You; Daniel Lee, Partner, Delivery Delight; and Jerene Ang, Deputy Editor, Human Resources, respectively. These were supplemented by innovative session formats such as Knowledge Café, Fishbowl Panel, Solution Room and Fireside Chat. A fun game of HR Bingo, created exclusively for Talent Management Asia, was also weaved into the programme. Change is not a question of if, but when. So how does the organisation prepare it’s people for the future? An end-to-end perspective is what is needed, which starts with people planning. Given that the HR personnel of the future are more of strategists, those are the kind of people we need to start hiring. As for performance management, if we want to send a signal to the organisation on transformation, we firstly need the moral authority to do so. We have to start with changing ourselves. One way to do this is to change the HR structure by introducing strategic HR. Picture your HR team being organised more like a consulting firm, wherein they work on a day-to-day basis as a project team. Once the project is over, they will then move on to another project, thus enabling them an agile mindset. One of the speakers noted: “Many employees now want to collect experience. So if you are looking to keep people till they are in senior management, you are working against the force of nature.” Thus, in his view, we need to think of the ecosystem differently, providing them exposure to different geographical areas, functions, and more. If you want better results, you build a better strategy. If you have a brilliant strategy, you get brilliant results, right? Wrong. Brilliant strategy does not equal brilliant results. Strategy x execution = results. But there’s a hidden factor called trust. “If the lines between the layers of leadership are not wrapped in high trust, then you will not get good results,” noted one of the speakers. Most performance issues are actually trust issues in disguise. Building a high-trust culture starts with us, it starts with character and competence. If trust is not there, speed goes down and cost goes up. And vice versa, if trust is there, speed goes up, and cost goes down. Nowadays when high-performing talent have more options than the employers do, the more organisations share about themselves with the prospective employee, the more it sets the tone about how open they are. When you are bringing someone aboard, we should know that they will be an brand ambassador whether or not they join. Yet, candidate experience sometimes tends to be overlooked especially when an employee applies for a job internally. It is the onus of the manager to go back to the employee and tell them why they are not hired for the role, thus engage them and give them a good experience. Similarly, when conducting psychometric assessments during recruitment, we can share the assessment profiles with not only the successful candidates, but the ones who were not successful, as it would help the candidate experience. “At the end of the day, you have to remember that even if the candidate does not join you now, they are still your potential talent and may join you someday,” one of the panelists pointed out. An equally important thing to think about is keeping top talent inspired at all times. Certainly, great food for thought as shared by a number of delegates. This knowledge was shared at the Human Resources’ conference, Talent Management Asia 2019, Singapore. To know more and attend such events, please visit: http://www.humanresourcesonline.net/events/.